Cadbury Railway Wharf Bridge No 77A is a minor waterways place minor waterways place place on the waterways major waterways place village town city on the Worcester and Birmingham Canal (Birmingham to King's Norton) between New Selly Oak Junction (Junction with re-aligned and restored Dudley No 2 Canal) (5¼ furlongs to the northwest) and King&apos;s Norton Junction (Junction of Stratford and Worcester and Birmingham Canals) (1 mile and 6¼ furlongs to the south). 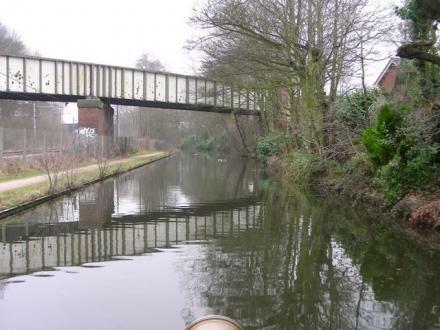 The nearest place in the direction of New Selly Oak Junction is Raddlebarn Road Bridge No 78 (With pipe bridge alongside and access to The Country Girl PH); 1 furlong away. The nearest place in the direction of King&apos;s Norton Junction is Bournville Stop Narrows (A pedestrian drawbridge linking Bournville Wharf with the towpath has long gone. ); 3 furlongs away. 628-630 Bristol Road, Birmingham, B29 6BQ — 1236 yards to the north. 1 Raddlebarn Road, Birmingham, B29 6HJ — 240 yards to the north. 1364 Pershore Rd, Birmingham, B302 — 998 yards to the southeast. 9 Raddlebarn Road, Birmingham, B29 6HJ — 229 yards to the north. 17A Raddlebarn Road, Birmingham, B29 6HJ — 241 yards to the north. Birmingham, B16 0LQ — 1175 yards to the north. Franklin Road, Birmingham, B30 2HG — 1614 yards to the south. 3A Teignmouth Road, B297BA — 861 yards to the north. 618-620 Bristol Road, Birmingham, B29 6BQ — 1250 yards to the north. Birmingham — 1283 yards to the southeast. 1586 Pershore Road Stirchley, Birmingham, B30 2NH — 1608 yards to the south. 491-493 Bristol Road, Birmingham, B29 6AU — 1429 yards to the north. 1495-1501 Pershore Road, Birmingham, B30 2JL — 1309 yards to the southeast. Unit 15 Stirchley Trading Estate, Birmingham, B30 2PF — 1305 yards to the southeast. Birmingham, B29 6 — 855 yards to the northwest. Bournville Lane, Birmingham, B30 2 — 988 yards to the south. West Drayton, UB7 7AR — 1399 yards to the southeast. Birmingham — 1166 yards to the west. Unit 10, 18 Selly Oak Shopping Park Aston Webb Boulevard, Birmingham, B29 6SQ — 1574 yards to the northwest. Selly Oak — 969 yards to the northwest. Bournville — 721 yards to the southwest. selly oak, Birmingham, B29 — 1468 yards to the west. Birmingham, B30 2NU — 1285 yards to the southeast. Linden Road, Bournville, B30 2LU — 656 yards to the south. Birmingham, B30 1 — 655 yards to the south. Stirchley, Birmingham, B30 2NU — 1288 yards to the southeast. Lyndworth Road, Birmingham, B30 — 1370 yards to the east. Birmingham — 1616 yards to the southeast. Birmingham — 1380 yards to the southeast. Birmingham — 1418 yards to the northwest. Westlands — 1231 yards to the south. Birmingham — 658 yards to the south. Birmingham — 1464 yards to the east. Unit 12 , Stirchley trading estate , Hazelwell road , B30 2PF, Birmingham — 1341 yards to the southeast. Birmingham — 1220 yards to the northwest. Weoley Park Road, Birmingham, B29 6QU — 1509 yards to the west. Birmingham — 141 yards to the southeast. 1022 Bristol Road, Selly Oak, Birmingham, B29 6LG — 1224 yards to the west. Birmingham, B29 7 — 1234 yards to the northeast. Twitter: @TheTab, Birmingham — 1510 yards to the northwest. 3rd Floor, Avebury House, Birmingham, B3 3RB — 1497 yards to the east. Olton — 1298 yards to the northeast. 1528 yards to the north. 861 yards to the north.